The donor I'm looking for is a department-store 21 speed with a 3 piece crank. Ideally it would have a frame-mounted derailleur and a chain guard, but that's not critical. Better mountain bikes will have a cassette, which won't work in this application. I've seen bikes that would work for around $20. All we need are the drive train parts--if the rest of the bike is trashed, it won't affect the build. Since it is hard to fit a bike in a Cavalier, I'm taking a tubing cutter so I can chop the frame in pieces to get it home. Like many trikes, the Meridian uses an intermediate gear system. 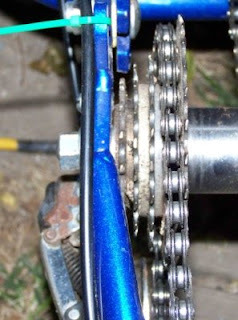 The main chain goes between the crankset to an intermediate hub. The intermediate hub has a freewheel, a brake and a fixed sprocket. 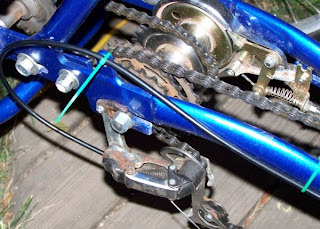 A chain runs from the fixed sprocket to another fixed sprocket on the rear axle. The conversion is relatively straightforward. I removed the old freewheel on the intermediate hub and replaced it with a 5 speed freewheel. I also installed a low-end Shimano derailleur, the type that is held on by the back wheel. The two holes are meant for a pin spanner. I don't have the right size so I used a pair of needle nose pliers with the tips ground to fit. Threads are opposite, so clockwise unscrews. On other freewheels, I've used a punch and hammer. 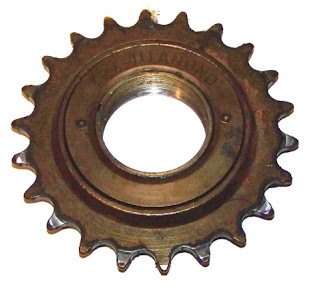 Once you unscrew the ring, you will be able to lift the sprocket off the body. The aforementioned thousands of balls will fall out. This exposes the part of the body that unscrews from the hub. I used a vise, locking pliers would probably work. This is standard threads, removes by turning counterclockwise. Ideally, I should have used a longer axle in the intermediate hub--The derailleur side needed some extra space to fit. I was able to shift it enough so there is just (barely) enough axle on each side. I'd probably want more thread engagement on a bicycle, but this doesn't hold the wheel on so stress should be less. I need to do something here--I need just a little more space than I have, and I am at the limit of the original axle. If the donor bike's axle is longer I will use it, otherwise I will fabricate a different derailleur mount that doesn't rely on the axle nuts. You will need some washers or spacers to add some space to the freewheel side, so the nut is past the freewheel. You also need some washers to go between the main frame and the rear axle carrier to get a bit more space. Since the main frame is aluminum, you need to be careful not to spread it too far--Aluminum is not as forgiving as steel to being spread. I need about 5 mm more space...I gained about 3mm. This is just enough to let the freewheel fit when the intermediate hub was positioned right, but not enough to let the chain ride on the smallest cog without rubbing and probably jamming up on the frame. Not a major problem in this application--The goal was better hill climbing, not speed, and the 4 remaining gears give one gear higher and two gears lower than the original--the ones that would be most used. I adjusted the travel screws to lock out the smallest cog. I can get the space in the frame, but unless I either get a different axle or a better way to hold the derailleur, I don't have enough space in the hub. The next problem was the derailleur. 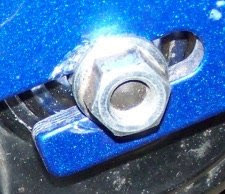 The standard mount for this cheap type uses a special D-shaped nut that sits in the axle slot to keep the derailleur aligned. Since I had virtually no extra space, this nut was enough to rub on the freewheel. Instead, I moved the derailleur and hub back a bit, and drilled and tapped a hole in the bike frame to replace the D nut. 5 speed index shifters are rare, but 6 speed use the same spacing and will work with most Shimano 5 speed freewheels. The spare shifters I have were 7 speed. Luckily, they have a friction mode, letting them be used with the 5 speed spacing. The final version will most likely use 7 speed spacing, so I'll leave them for now. Future plans are to change the spacing of the freewheel. If I use 5 gears with the spacing of a 7 speed cluster, I'll save another 2mm or so, which should be just enough to use all 5. There are a few different possibilities--The most likely is to salvage cogs and spacers from a 7 speed and mount them to the 5 speed body. I could also shave the existing spacers down. Another reason to get a donor bike is the chain and front chainrings--Single speed bikes almost all use a wider chain, with wider sprockets. These will not work with derailleur parts. I took the largest chainring of the replacement off in hopes of making it work with the old chain guard. Unfortunately the guard bracket rubbed the inner chainring, so I still had to remove the guard. I will try to find a donor bike with the proper chainrings and a guard. (I passed one by at the thrift store that would have been perfect, days before I started this project) Trikes aren't likely to go as fast as bikes, so higher gears aren't really needed--The middle and small rings from a mountain bike set are plenty--In fact, for this use, I am only using the smallest chainring, since there is no easy way to mount a front derailleur. If you have any questions, feel free to ask--I'd like to know where I'm not clear, so I can improve these directions. All in all how hard was this to do, 'cause I'm going to be getting one of these trikes soon & I've been curious on how to do an upgrade like that. For me, finding the right parts was hardest followed by getting the axle for the freewheel right. If you can do general bike repairs, this should be manageable. * McMaster-Carr has M10x1 CroMo (4130) threaded rod, which can be used to make a new axle for the transfer hub, giving more freedom of side to side adjustment. * Amazon has SRAM MRX grip shifters for Shimano rear derailleurs for 5,6,7 & 8 speed. * go with a Shimano TX-55 rear derailleur ($15- delivered) worth the extra $. im working on a meridian right now. i found the same donor bike you did for the pedal assembly. same 3 gears.instead of using the hub im thinking of just taking the spokes off of a ten speed rear wheel and using that hub. then mounting a gear to the opposite side to drive the rear wheel gear on the trike. any thoughts on this? Not an expert, but from what I understand most hubs aren't strong enough to transfer torque from one side to the other--torque goes through the spokes on only one side to the rim. I would also think that attaching accurately would be difficult, and you would have to do something else about brakes. I removed the stock rear brake. Cut ½” out of that side of the hub and reweld the two together. This gave me more then enough room for the 5 speed freewheel. No need to stretch the frame. Thanks for the inspirational footwork! I've got aa "Prime Meridian" instead of a "Franken-Trike"
I know your Meridian conversion post is old, but it's still good! I received a used Schwinn Meridian as a gift. It was intended to make it easier for me to get around, get groceries, and have fun. It was such a heavy tank, I had a hard time pedaling up the relatively slight grades and against the winds. I'm a 56 year-old with a prosthetic right leg. Your post gave me enough encouragement to try it myself. I started with your 5-speed freewheel and old spare-parts. I still had trouble tackling hills and/or windy days. I put a mountain bike triple crank on the front, and fabricated a "fake seat-tube" to mount the front deraileur on. I finished by making a seat-post extension to let me get more power in my pedal stroke. And I made a pedal modification for my prosthetic leg! The pedal is wider so my heel doesn't hit the crank arm. The pedal is also about 3/4" taller than the other. That smooths my pedal stroke compensating for my legs reduced flexibility. I've got photos. Send me your email if you want to see them. I just converted my Maridian single speed to a 5 speed by purchasing a 5 speed kit on line. Since the 5 speed hub does not have a 7" axle, I cut away the outer attaching rear frame and drilled a hole on both sides to take the place of that support and adjustment of the rear sprocket chain. All I had to do with the rear sprocket was move it all the way over to get it into alignment. Didn't even use all the parts in the kit and was able to use both of the original chains the bike came with without taking them apart. Took me one afternoon. Feel free to contact me. Can you tell me which kit you used. Do you have any photos of the project.